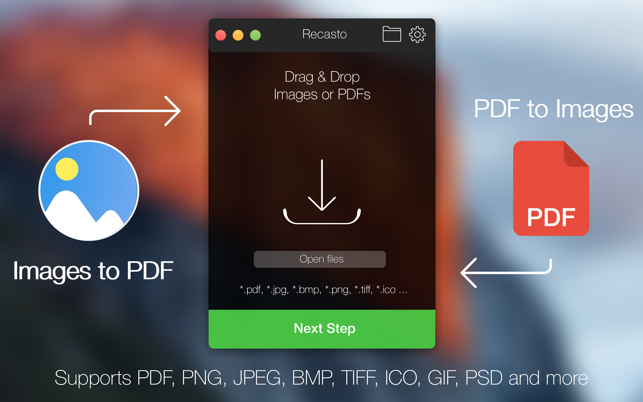 Recasto - allows you to quickly convert PNG, JPEG, TIFF, BMP and many other image formats to PDF, as well as PDF to Images. 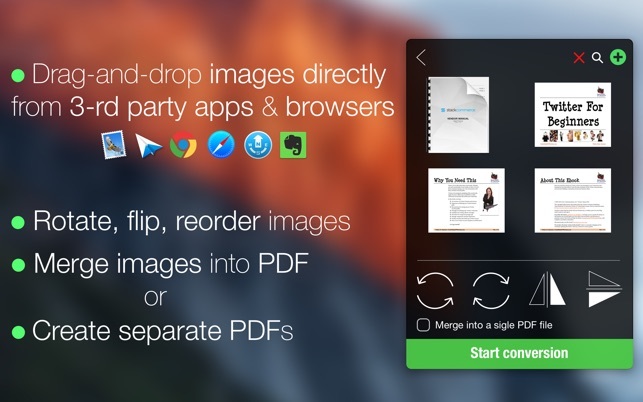 You just drag-and-drop images or PDF files (or even PDF pages) from Finder, web browser, PDF editing software or Preview. After that, Recasto will come up with various set up options to achieve the best conversion result for you. For example, images can be rotated or flipped before conversion and while converting PDF to images you can adjust the DPI level to your liking. 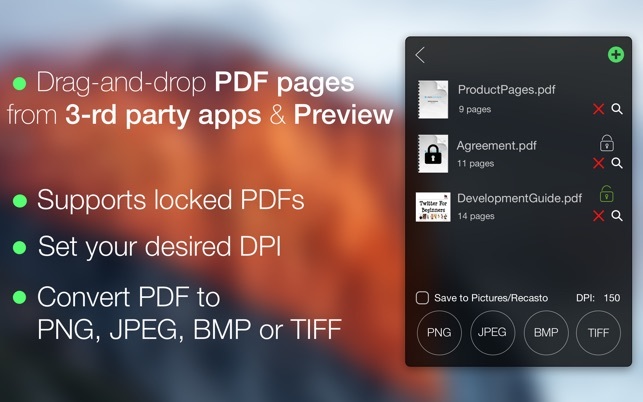 Images can me merged into a single PDF file or Recasto can create a separate PDF for each one. Please note that Recasto supports locked/encrypted PDF files, but in order to process it, you will have to enter a correct password for each locked PDF file. In general, the app is pretty simple to use and gets the job done. I never write reviews but this is just exactly the way apps should be designed. It does exactly what it says intuitively, quickly, downloads within seconds, was able to convert huge pdfs of over 300 pages full of images in hi res in under 3 mins. Great app. I’d like to take 10 one page PDF files and convert them to JPG files with the same names. Recasto doesn’t give me enough control to do that. Instead it puts each page (in this case only one) in a folder and I have to do the renaming. Also it’s interface is such that you aren’t sure when the conversion starts or ends. Easy to use. Recommended! Simple drag and drop interface and user-friendly, simple directions made my conversion from PDF to JPG quick and painless.